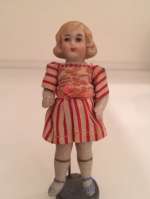 This is a nice small French SFBJ bisque girl for the doll house. Bisque head and wood/papiermache body-all original. Fine painted facial features, black wig. Dressed in her all original out-fit with hat and underwear. Painted stockings. She is 9,5 cm / 3-3/4" Tall. Very good condition. 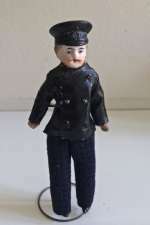 5,9" (15 cm) Rare dollhouse man 19.th cen. Molded hat. 5,9"(15 cm) Rare dollhouse man 19.th cen.Head and Torso made of wood, the head shaped of paper mache or gesso.Expert painting and molding of the face and head. Hands with thumbs and indicated fingers..Lower legs papermache or wood. 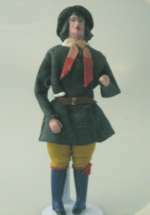 This gentleman is dressed probably as a peasant or musketeer with his page-boy hair and outfit made of felt and wool, molded hat,blue boots, belt.. all original and in fine condition. 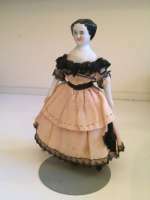 I have 3 of these wonderful rare dolls, that I sell seperately. (Described and shown in "Miniature Dolls" by Evelyn Ackermann, who made research on the dolls.P.201). This is a nice small blond girl for the doll house. She is made in Germany. Fine painted facial features, molded blond hair. Dressed in heroriginal red/ white antique gown. She is all bisque. . Fine molded and painted shoes and stockings.. She is 9 cm / 3-1/2"" Tall. Very good original condition. 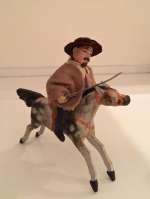 Dollhouse Driver with molded hat and moustasche. 12,5 cm/ 5"tall .Dollhouse man, driver/chauffoer with bisque molded decorated hat. His uniform matches his hat. The jacket is coated. Blue checked trousers. He is blond with a sculpted Moustache. Fine original condition.No cracks. Very nicely painted.. Also good as a Driver for a Tinplate car. All-bisque dollhouse boy in his all original dress. This is a charming boy. 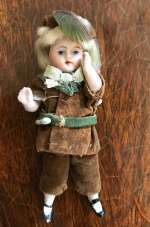 He is an All-bisque doll with with a lovely painting. He has jointed limbs and is wearing his all original antique wonderfully detailed dress with hat and with a lot of decoration He is just adorable. H. 3 3/4" / 9,5 cm. Ca 1880 Excellent condition.. This is a charming toy of a young man on a papermache horse boy playing soldier! His head is all-bisque with a lovely painting with moustashe andpainted dark brown eyes. 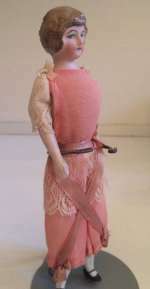 His body is paper mache and he is wearing his all original antique wonderfully detailed woolen dress and a sward in his hand. His horse is paper mache. He is just adorable. High of toy:H. 4 3/4" / 12 cm. Length: 5-1/10"/ 13 cm. Ca 1880 Excellent condition.. Very good original condition. 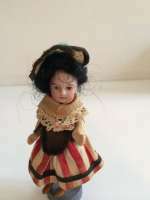 Elegant all original bisque dollhouse doll with bun 7"